In school, you learn that fire is dangerous. As early as the dinosaurs, living beings knew that when fire was touched, it would burn. For this reason, it’s important to ensure that when you have valuables you do everything you can to protect them from a fire. Whether you have a business that you’ve poured your heart and soul into or it’s a warehouse that has property to be distributed, it’s vital that you take the necessary precautions to protect your establishment from outside elements. While you may be preoccupied with burglaries, it’s important that you take the time to learn about fire doors and the many benefits they present to you, especially if you work in a facility that deals with fire. For more information about fire doors and fire safety, contact us today. 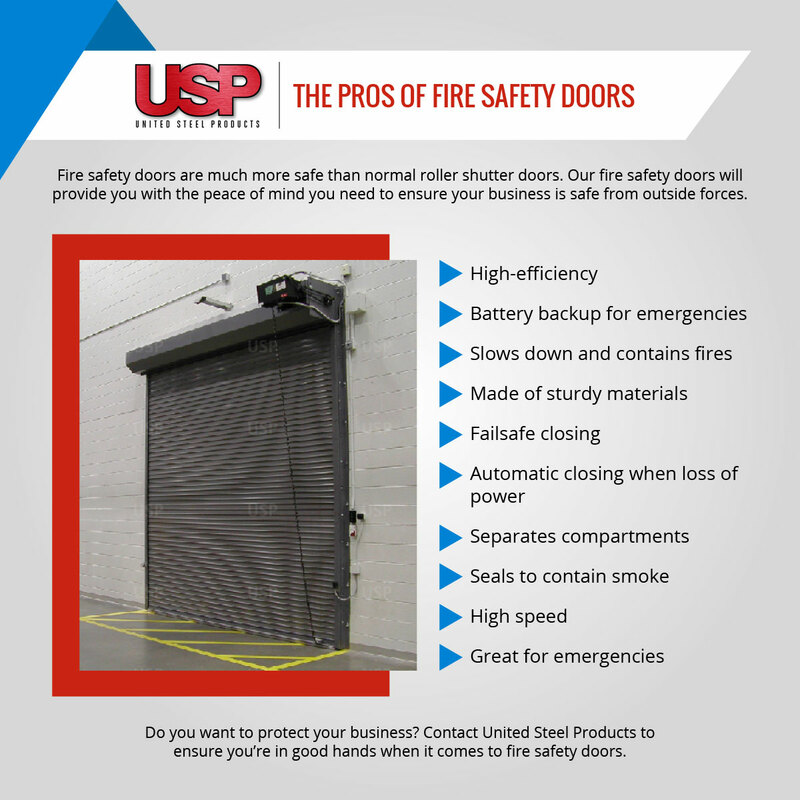 At United Steel Products, we’re proud to offer a variety of fire doors that will ensure you are able to keep your business protected. We have the Model 700, Model 750, and the Model FDC. Each of these models offers you a little something different, but the most important factor is that they are specifically for facilities that want to keep their establishment safe from fire. We also have fire door accessories that will make your door even more secure. If you work in a facility such as a healthcare facility or a chemistry lab that deals with possible fires, then these pros will be beneficial to ensure your establishment stays safe. While we encourage the use of fire doors for many commercial businesses, it’s vital for those who are exposed to fire. For more information about fire doors, check out What You Should Know About Fire Doors. Additionally, check out the pros of installing fire doors in your warehouse, healthcare facility, factory, cafeteria, and other establishments. 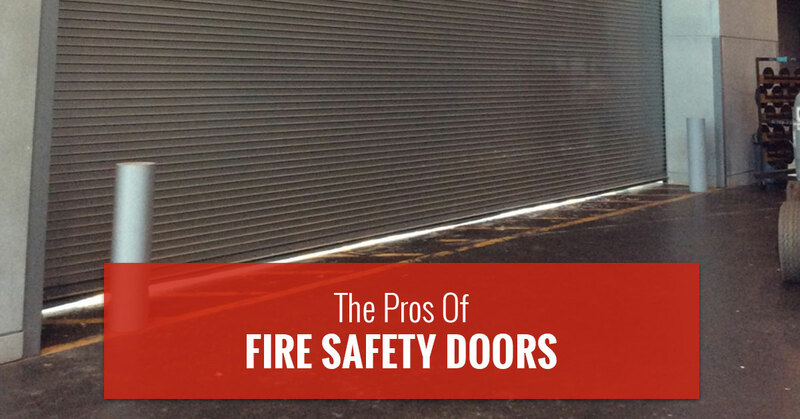 Fire doors are perfect because they provide your business with protection. A lot of the time it’s thought that establishments need protection against other people or the weather, but sometimes, it comes down to the elements. Fire is something that can blaze a trail of destruction. One of the factors in protecting your facility is to ensure that the doors you have in your facility are able to meet your expectations and that means limited damage. While not many things can stop fires, our fire safety doors can slow them down. Our doors will automatically close to cut off the amount of smoke and fire in the building from expanding. The doors are made to control a fire and that’s exactly what you can expect from these doors. Each of the models we offer will do more than protect your establishment. They each offer failsafe and automatic closings, which helps to close the door with a controlled descent. The last pro is that it will hold the building in place as the fire burns. As the fire burns, it’ll do damage to the room that it’s in, but it won’t spread to the rest of the building. It’s vital that there is something keeping the building sturdy as the fire begins and takes shape. While we know that fires happen, that doesn’t mean that you have to be ill-prepared for the situation. Our fire doors will hold the structure in place and even shut it down if the fire is small enough. Make sure your facility is protected when you use fire safety doors. Learn more pros by checking out our infographic below. If you’d like to purchase one today, then we encourage you to reach out to us as soon as possible.